David Leech, The Hammer of the Cartesians: Henry More’s Philosophy of Spirit and the Origins of Modern Atheism (Peeters, 2013). Henry More (1614-1687) was probably the most important English philosopher between Hobbes and Locke. Described as the ‘hammer’ of the Cartesians, More attacked Descartes’ conception of spirit as undermining its very intelligibility. This work, which analyses an episode in the evolution of the concept of spiritual substance in early modernity, looks at More’s rational theology within the context of the great seventeenth century Cartesian controversies over spirit, soul-body interaction, and divine omnipresence. This work argues that More’s new, univocal spirit conception, highly influential upon Newton and Clarke, contributed unwittingly to a slow secularisation process internal to theistic culture. 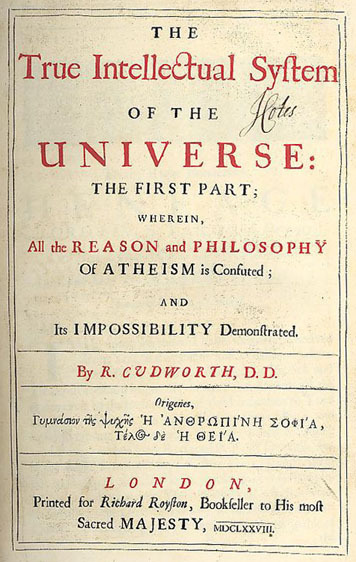 It thus fills a lacuna in scholarship by examining how conceptual changes in early modern metaphysics, as opposed to better researched transformations in moral philosophy, were an additional ingredient in the origins of modern speculative atheism. It also suggests that these controversies are by no means merely of historical interest but represent a resource for contemporary philosophical reflection. On Monday 25th of November at 4.00 pm-6.30pm there was a session of the American Academy of Religion at Baltimore on ‘Cambridge Platonism Revisited’. Proclus posits Love (erôs), Truth (alêthia) and Faith (pistis), terms he discovers in the Chaldean Oracles, as the sympathetic (sympatheia) and uplifting powers (anagôgoi) that cause the union of the One and the “one in the soul.” For Proclus, rational faith should be differentiated from the irrational faith in Plato’s “divided line” analogy because it initiates one into union with the Good through an intuitive resting within the common notions (koinai ennoiai) of the intellect. The Cambridge Platonist, Peter Sterry uses the Chaldean Triad, translated as knowledge/understanding, faith, and love in his treatise on free will and in his sermons on Matthew. Sterry’s concept of the unity of the intellect and will in the soul is dependent on Proclus’s idea that “all things are in the soul.” This Unity is the Word who dwells naturally within the soul. For Sterry, however, a supernatural knowledge, faith, and love are necessary in order to reach perfect inward unity. In his sermons on Matthew, Sterry says that faith is the third link of the divine chain by which God draws up human souls to himself. Faith causes Truth to come into sympathetic harmony with truth in the soul. Faith is the human counterpart of divine Love within the Godhead, which ignites the flame of love in the hearts of believers. Though some have labeled Sterry’s opinion concerning the weakness of the post-lapsarian will as “Calvinistic” a more balanced perspective will not fail to mention the influence of Proclean Neoplatonism on Sterry’s concept of rational faith and its philosophical underpinnings. This paper concerns the intersection of philosophy, theology, and politics with respect to the question of the readmission of Jews to England in 1655-1656. By examining the theological interests and philosophical commitments of the Cambridge Platonist Ralph Cudworth–and, at the same time, by acknowledging the sources and range of his political access–it is possible to see the tensions underlying his recommendation of religious tolerance. Attention to several of the positions espoused by Rabbi Menasseh ben Israel, whom Cudworth met in London on the occasion of the Whitehall Conference, will show a similarly complicated coincidence of political and theological views. As Cudworth sought to read Plato through the lens of Moses, and as Menasseh attempted to approach Kabbalah by way of Neoplatonism, we may look to make sense of Cudworth and Menasseh’s philosophies politically. This paper explores the hidden role of Cudworth in shaping the Frühromantik reception of Spinoza through the intermediary of Herder. Herder was the most important source of Romantic Spinozism. His influential Gott Einige Gespräche über Spinoza’s System, ostensibly a defence of Spinoza, was in fact a revision of Spinoza along largely Cudworthian lines. After establishing the general relationship between Herder and Cudworth, this examination will outline three areas where Cudworth played a formative role for Herder. Finally, it will place Herder in the context of the Pantheism Controversy, which was so influential upon the Frühromantik. Examining the thought of exemplary key philosophers of the era, the essay collection Autonomy and Human Dignity. Origen in early modern philosophy, the second volume of the Adamantiana series edited by the Origen Research Centre in Münster, traces the church father’s reception in European humanism in the 15th and 16th, in English Platonism in the 17th and in German Idealism in the 18th and 19th centuries. Origen’s concept of freedom is instrumental in shaping the modern notion of human autonomy and dignity. After the humanists Pico della Mirandola, John Colet and Erasmus of Rotterdam, it is the Cambridge Platonists who, following in their footsteps, take up Origenian theology to combat the nascent naturalism of early modern philosophers like Thomas Hobbes and Baruch de Spinoza. In a survey of the English Platonists’ appropriation of Origen in moral and religious philosophy, Ralph Cudworth, Henry More and Anne Conway are shown to reformulate key insights of the church father’s Platonism, including his anti-voluntarist notion of the Trinity, his doctrine of the soul’s pre-existence and his universal soteriology, in the light of the early modern debates on Arianism as well as determinism and naturalism. Not only did the Cambridge Platonists create a new theological paradigm based on Origen’s liberal Christian philosophy, but also paved the way for the historic religious philosophies of the Enlightenment and German Idealism.